So she decided to ask him. In most cities, towns and villages in Spain, there is a special focal point for Christmas; that of the nativity scene, known as a ‘belén’ (Spanish for Bethlehem) which is set up in the town square or besides the church. In some villages, just the main characters in the story of the birth of Jesus are represented, whilst in larger towns, very elaborate beléns are set up which may include allegories of the town and surrounding area, as well as the main story. According to legend, St Francis, whilst on his pilgrimage to Holy places, celebrated Mass on Christmas Eve 1223 in a cave in a little Italian town called Greccio. He set up a living representation of the birth of Christ for the townspeople including a donkey and an ox. This is therefore considered to be the first ever ‘belén’. The same legend says that because it was so cold, St Francis used a doll to represent the baby Jesus. At the moment representing the birth of Jesus, the doll began to cry. The first Belén using figures on record was created by Arnolfo di Cambio in Florence in 1289 using white marble. Part of this original scene is still preserved to this day in Rome. During the fourteenth and fifteenth centuries, churches throughout Italy were decorated at Christmas with beautiful nativity scenes created by famous artists such as Andrea della Robbia. The belén was introduced to Spain by the Franciscan monks in the fifteenth century. The oldest surviving Spanish Belén dates from the sixteenth century and is called the ‘Belén de Coral’. It is housed in the Monasterio de las Delcalzas Reales in Madrid and is made of coral, bronze and silver. Carlos III had a belén created for his son, Carlos IV, which had more than 200 figures created by the Valencian artists José Estévez Bonet and José Ginés Marín and the artist from Murcia known as Salzillo. This belén is known as ‘El belén del Principe’ and many of the figures are preserved in the Royal Palace. It’s nice to think that the Royal children will be able to look at the same figures as all their forebears. Salzillo became, in effect, the father of the craft of creating Beléns in Spain; a craft which is continued to this day by skilled artists. It is part of the tradition of Spain for the children of the family to be taken along to see the nativity scenes in much the same way as children in other parts of Europe will be taken to see Santa. 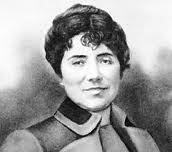 Rosalía de Castro was a poet and novelist who wrote in both the regional language of Galicia, gallego, and in Castilian Spanish. She is best known for her “Cantares Gallegos” which are considered the greatest works of poetry in Gallego and of primary importance in its recognition as language. Rosalía de Castro is also regarded as a pre-cursor of modern Spanish poetry and today is an icon of Galician culture. During her lifetime Gallego was considered a lower-class dialect with Castilian Spanish thought to be the only language suitable for literature. In addition, the literary efforts of women were not taken seriously, so for much of her life Rosalía struggled in the face of indifference, ignorance and scorn.